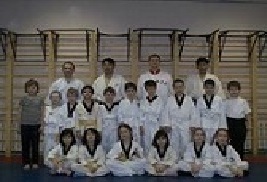 experience and started learning "judo" from a very early age. As a teenager, he was a noted talent at "ne-waza"
while attending Tsuyama Senior High School, the former Tsuyama Middle School, which is knowns for many expert judoists for "Kosen Judo". Nobuhiro Teruo is a self defense aficionado, and has been studying various martial arts and combat sports including Karate, Aikido and Muay Thai. While Nobuhiro Teruo was an instructor of Ashihara Karate, in order to instruct and to judge challenges, he often visited branch offices across the country with a genius karate master Hideyuki Ashihara who is a founder of Ashihara Karate and promoted "sabaki" method to the world. 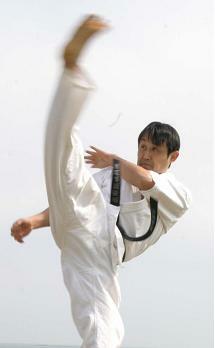 Nobuhiro Teruo also taught arrest techniques to the Japan Self Defense Forces, police departments and courthouses security personel. He has even held seminars on self defense in Lithuania, Singapore and Russia. Currently he promotes a practical self defense system based on karate across the country through workshops and self defense classes. His published books and DVDs are as follows. "Self Defense For Children", "Revolutionary Self-defense Techniques", "Revolutionary Self-defense Techniques For Everyone (DVD)" and "Self Defense System Based On Karate vol.1&2 (DVD)". Also, he appeared in the popular TV show titled "Omoikkiri ii TV" by Nippon Television Network Corporation and has received extensive media coverage. ●Held self defense seminar in New York,USA. ●Held self defense seminar in Moscow. ●Held self defense seminar in Singapore. ●Teach ground grappling technique at Titanas gym. ●Teach "ne-waza"(ground grappling technique) at Lithuania Judo Club. ●Had intensive muay thai training at the gym that former K-1 world champion "Buakaw Por Pramuk" belongs to. ●Had intensive jujitsu training with Marcos, jujitsu world champion. ●Popular TV personality experiences training at our dojo. ●Popular TV personality experiences our self defense system. Nobuhiro Teruo's published books and DVDs. You can order from Amazon.co.jp. Protect you, your loved ones and your family from dangers or life threatening situations in everyday life. Focuses on only effective self defense techniques that everyone can learn. There is a good way even for scream and getting away. Must read for parents and teachers. You can learn basics of self defense from scratch. Show you all the techniques of self defense to prevent critical situations. You can learn striking techniques of our self defense system from scratch. Thoroughly instruct points derived from years of experience teaching self defense, which are most beginners struggle with. How to use basic skills in actual fighting. Introduce know-how that only taught in dojo. Your defense skills will be improved dramatically with this DVD.